Magnecor’s R-100 Racing (10mm) Ignition Cables feature Magnecor’s exclusive 2.5mm high capacity Metallic Inductance EMI Suppressed conductor consisting of stainless steel wire precisely wound at 200 turns per inch over a ferrimagnetic core. The insulating jacket is made entirely of Magnecor’s exclusive TC-1500-HS high strength aerospace grade silicone rubber, and its single layer construction will prolong the jacket’s insulating ability by conducting extreme heat away from hot-spots that occur near over-the-limit heat sources. The R-100 10mm jacket has a service heat resistance of 700 degrees F (380 degrees C) and up to 1,200 degrees F (650 degrees C) for short burst 3 minutes. Even if limits are exceeded, the silicone rubber will retain its insulating ability until wires are removed from engine. Magnecor Race Wires are primarily designed and constructed to be used in applications where it is essential to prevent the possibility of ignition wires compromising engine performance. Modern race engines, modified street engines and stock street engines which rely on electronic devices to control the function of either or both the ignition and fuel systems are prone to interference from all other spiral conductor ignition wires sold through performance parts outlets, none of which can provide proper suppression for EMI, particularly if a high-output ignition system is used. Magnecor always recommends the use of Race Wires for any stock or modified late model street engine that is electronically managed, however most other modified or street engines can also use Magnecor Race Wires to improve ignition performance. 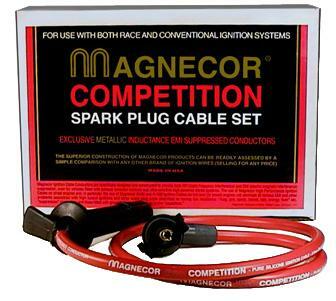 All Magnecor R-100 Racing 10mm Plug Wires are Red in color.